Let every person be subject to the governing authorities; for there is no authority except from God, and those authorities that exist have been instituted by God. This is my commandment, that you love one another as I have loved you. No one has greater love than this, to lay down one’s life for one’s friends. You are my friends if you do what I command you. I do not call you servants any longer, because the servant does not know what the master is doing; but I have called you friends, because I have made known to you everything that I have heard from my Father. You did not choose me but I chose you. And I appointed you to go and bear fruit, fruit that will last, so that the Father will give you whatever you ask him in my name. I am giving you these commands so that you may love one another. If the world hates you, be aware that it hated me before it hated you. If you belonged to the world, the world would love you as its own. Because you do not belong to the world, but I have chosen you out of the world – therefore the world hates you. Preachers can fall into the rut of preaching on whatever keeps the congregation pleased; keep them happy and they’ll keep coming back, or something like that. This sermon series is something different. Instead of falling back to the familiar narratives that keep us smiling on our way out of church, we are confronting some of the greatest controversies facing the church. There is a better than good chance that I will say something from this pulpit over the next two months that you won’t agree with, and if that happens I encourage you to stay after worship, join us for lunch, and continue the conversation. We can only grow as Christians in community, and that requires some honesty and humility and dialogue. Today we begin with The Separation of Church and State. 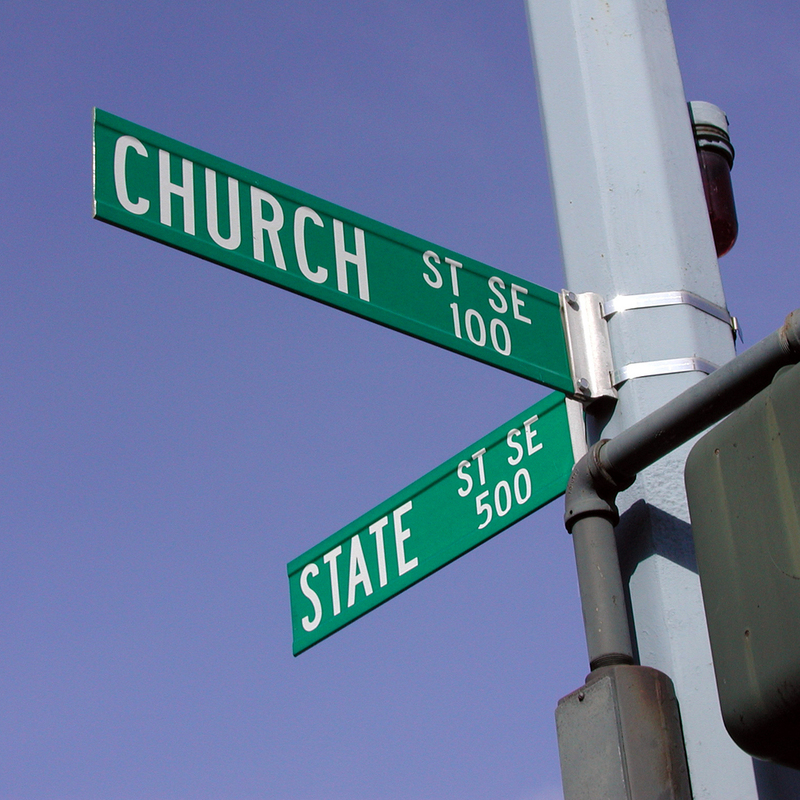 The Church and the State have a long and complicated relationship. Like a number of romantic couples from popular TV shows, think Ross and Rachel, Sam and Diane, Jim and Pam, Luke and Lorelai, and even Kermit and Miss Piggy, the “will they/won’t they” question of their relationships has happened over and over and over again. It began during the days of Jesus. A wandering and poor Jew developed a following that threatened the power dynamics of the Jewish leadership and the Roman Empire. His actions might have appeared innocuous, feeding the multitudes by the sea, healing the blind, walking on water, but what he said terrified those in power: “The last shall be first and the first shall be last,” sounds the beginning of a call to revolution. And for living and healing and preaching the way he did, Jesus was nailed to a cross. But three days later he rose from the dead. The Christian church began in the wake of Jesus’ resurrection, the power of the Good News of God’s triumph over death spread throughout the region and small groups gathered together to worship the Lord Jesus Christ. The book of Acts, and Paul’s letters, help us to see how the story traveled and took hold of the communities where it was received. Lives were transformed; the gospel spread, and the kingdom began to become incarnate. But whatever the church stood for, and whatever the state stood for, was very different. The first Christians were strange, with their singing songs to a man who died on a cross, and sharing bread and wine, and promising to be good and trustworthy. How bizarre. And for nearly 300 years they were persecuted, abused, and killed for following Jesus. The state, Rome, resented the Christians and their weirdness. They refused to bow down to worship the Emperor like everyone else. Instead they believed some guy named Jesus was Lord. And for that, they were punished. In the year 312 CE something happened that forever affected the relationship between the church and the state. I cannot overemphasize this point enough; it changed everything. The story goes that emperor Constantine was preparing his troops for a battle against a rebellion from within the empire, and on the night before the battle he had a vision of the Greek letters Chi (X) and a Rho (P) in the sky and the words, “in this sign you will conquer.” From this vision Constantine ordered all of his troops to be marked with the Chi-Rho, which looks like the symbol on the right hand page of your bulletin. Chi and Rho are the first two letters of Christos (the Greek version of “Messiah”). After doing so, Constantine’s army won a decisive victory and he entered Rome shortly thereafter as the undisputed Emperor. The battle gave him complete control of the Western Roman Empire and it paved the way for Christianity to become the dominant faith. The very next year Constantine issued the Edict of Milan, which made Christianity an officially recognized and tolerated religion in the Roman Empire. Within a dozen years, he called for the Council of Nicaea, which was the first attempt to attain a consensus in the church through an assembly representing all of Christendom. From a vision of two Greek letters in the sky, Christians went from being persecuted and murdered, to being part of the state religion. And now we fast-forward to today, to the United States, to a country founded on the principles of religious freedom, tolerance, and the Separation of Church and State. After centuries of the church and state co-mingling to a frightening degree, the founders decided to move in a different direction. After being persecuted for their different religious convictions they envisioned a new way forward. Recognizing that this place was, and could continue to be, a melting pot of differing ideologies, the forefathers articulated a political system whereby the state could not control religion, nor could religion control the state, and that those two things would find their fullest potential while being completely separated. Constantine’s vision of conquering under the sign of Christ was over, and the time of secularism began. Paul, writing to the Christians in Rome, said, “Be subject to the governing authorities.” This is to say, follow the laws of the land, pay your taxes, be good citizens. Paul’s words echo through the centuries and reverberate here in this sanctuary: Do as the country tells you to do. If you’re called to serve in the military, go to war. If its time for a presidential election, vote with your conscience. If the government says there’s a separation of church and state, keep it that way. And Jesus, speaking to his disciples said, “This is my commandment, that you love one another as I have loved you… If the world hates you, be aware that it hated me before it hated you. If you belonged to the world, the world would love you as its own. Because you do not belong to the world, but I have chosen you out of the world – therefore the world hates you.” Jesus’ words echo through the centuries and reverberate here in this sanctuary: Following me means acting like me. If people are being persecuted, you are to love them with every fiber of your being. If the government starts belittling people for what they believe, you need to stand up for the oppressed. If you feel called to live like a disciple, prepare yourself to be hated by the world. These two scriptures from Romans and John contain the tension of what it means to be a Christian in the United States. We constantly wrestle between being subject to the governing authorities and pushing back against the governing authorities. We wrestle between what it means to love the world and what it means to be hated by the world. We, as disciples, live in the world but we are not of the world. We may be citizens of the United States, but our truest citizenship is in heaven. Years ago there was a civil case raised against an organization for displaying a nativity scene on public property. Because of the separation of Church and State, the concerned citizen believed the nativity scene had to be removed. However, when the matter was brought to trial, the court ruled in favor of the Christian display. The reasoning was that because the nativity scene was next to Rudolph the Red-Nosed Reindeer, Frosty the Snowman, and Santa Claus, it had every right to be there. Christians across the country rejoiced when the matter was settled and celebrated what they thought was a decisive victory for the church. But was it? Should we celebrate a time when the nativity is one of many signs of the holiday? Or should we savor its sacredness? Do we want the nativity to be the same as holiday cartoons, or do we want it to symbolize the profound incarnation of God in the flesh being born in a manger? A few years ago there was another civil case raised against a baker for refusing to bake a cake for a gay couple’s wedding. Because of the freedom of religion, the baker believed it was within his right to refuse service to people who went against his religious convictions. The matter went to trial and the judge ruled that the baker unlawfully and illegally discriminated the couple for their sexual orientation. Christians across the country protested when the matter was settled, and vehemently opposed the ruling. Were they right? Should Christians support the freedom to pick and choose who they serve? Or should they follow the command to love the way Jesus loved? Do we want the church to be connected with the religious liberty that isolates particular people, or do we want to go against the conventions of fanatical Christianity and love people regardless of any particular identity? The separation of the Church and the State is a good thing because for too long the state controlled the church. The Constantinian revolution was certainly responsible for spreading Christianity across the globe, but it also led to things like the Crusades and the Inquisition. Constantine co-opted the church for the role of government in such a way that it limited the qualities that made Christians strange, and instead made them normative. Gone were the days when people lived by the convictions of Christ, and instead they went to church because that’s what they were expected to do. So perhaps now is the time, the best time, to recover those qualities that will make the world hate us. Not the qualities of religious bigotry and prejudice that for too long have dominated the state’s view of the church. But the qualities of Christ-like love that drive the state crazy. Like refusing to bow and worship our country and our politicians as if they were gods, and instead worshipping the risen Lord. Like gathering together on a day set apart to hold ourselves accountable to honesty, truthfulness, and peace. Like sitting before a table of ordinary food of bread and wine that becomes the extraordinary gift of body and blood. We are in the world, but we are not of the world. We might have national citizenship, but our true Lord is Jesus Christ. We are like strangers living in a strange land. Amen. This morning concludes our Sermon Series on Questions. After polling the gathered body regarding your questions about God, Faith, and the Church this series was created. Last week we talked about the ever sensitive topic of forgiveness and whether or not to bury or cremate the dead. 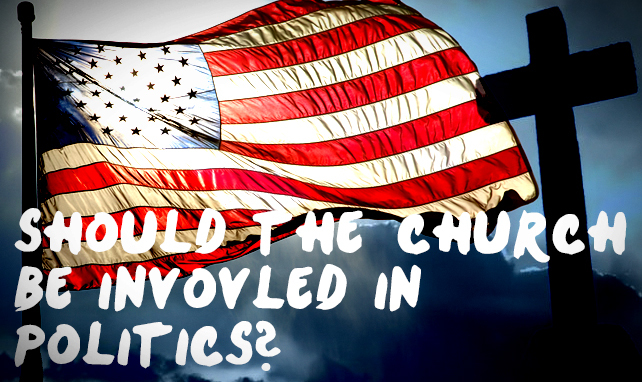 This week we finish by looking at the complicated relationship between politics and church. Before we begin I wanted to share with you some the actual questions that led to this sermon: How do we reconcile the divide between what we believe and particular political positions? The Old Testament seems to celebrate violence in God’s name. Jesus seems to permit only peaceful ways; So why do we live ready to go to war with whomever our government says we should? Is it right to have an American Flag in the sanctuary? Let every person be subject to the governing authorities; for there is no authority except from God, and those authorities that exist have been instituted by God. Therefore whoever resists authority resists what God has appointed, and those who resist will incur judgment. My office is far away from the main entrance to church. I can sit comfortably in the back hallway room, weeding through emails, making phone-calls, and preparing sermons while unaware of anyone entering the church and walking into the main office. If people arrive and desire to speak with me our secretary, Ashley, will either walk with them down toward my room, or call ahead to let me know that someone is on their way. I appreciate this system because I am rarely blindsided by a visit and can usually prepare myself for whatever enters the room. Usually. Ashley had already gone home for the day when I heard the doorbell ringing. I have learned that I have to run from my office to the entrance if I want to catch people before they give up and assume no one is at the church. So it was with a bible and hymnal tucked under my arm that I found myself sprinting to the door to welcome whoever was waiting. She was older, painfully shy, and carrying an absurd amount of political paperwork. She stuttered after I flung the door open and it took a lot of interpretation for me to gather that she wanted to talk about an upcoming election. On most days I would politely smile and decline her invitation, but I was in the mood to debate and argue, so I welcomed her in. For as much as I was frustrated with some of her language, and her desire for our pulpit to become a political microphone, she was absolutely right. Throughout history Christians have wrestled with the relationship between church and state, and Paul had to address these growing concerns as a major problem in the first century. Christians, since the beginning, have either granted rulers too much power and latitude, or else have refused to give up what is fully entitled to the rulers (remember give to Caesar what belongs to Caesar?). This has resulted in Christians being too subservient in some periods, while in others they have neglected their duty to the area they found themselves in. Paul wrote these profound words to the church in Rome because he thought that if we can be good citizens, we can be good disciples. We rely on governments, including our own, to bring order to the chaos of our world. As long as people persist in making our future unpredictable, Paul’s words will remain relevant. Wars will develop, evil will manifest itself in crime and violence, and the state will be here to protect the innocent. Is the church political? YES. We are political because we are subject to authorities over us that were instituted by God. So, in honor of the woman who begged me in my office to do something I never wanted to do, I say this: “Remember to vote.” Amen. I loved my AP Government class in high school. First of all, it was taught by the coach of our football team which meant that he spent more time working on the Xs and Os in his notebook than he did about the legislative branch and he was quick to reward us with stellar grades regardless of our effort. But mostly, I loved the class because it embodied, for me, all of the wonderful and incredible things I was about to experience. As a 17 year old, AP Government displayed the strange new world of our American System that I would soon be able to participate in through the right to vote. I eagerly absorbed our reading material because it was enlightening and it was relevant. Midway through our year together a serviceman showed up in our classroom, and my excitement quickly dwindled and was replaced with disappointment and fear. The marine stood at the front of our class in his uniform while most of us were still rubbing our eyes to wake up, and began to explain the Selective Service. In mere moments I quickly learned that by no choice of mine I would be registered for the Selective Service along with every other male between the ages of 18-25. The marine attempted to calm the nerves that were developing in the room by claiming that it will probably never amount to anything, but that the government needed to have us on record just in case we were ever needed for war. I was stupefied. How could our Government expect me to go to war when I believe in the one who calls me to love and pray for my enemies? How could our political system set aside young males, just in case, when it contradicts my understanding of God’s love and grace in the world? God’s kingdom is not of this world, our allegiances are somewhere else. Doing things liking pledging allegiance to the flag and printing “In God We Trust” on our money draws us away from the one in whom we live and forces us to choose between God and country. Those two things are not the same. Having an American flag in our sanctuary is very dangerous because it, on some level, implies that what the cross represents is equal to what the flag represents. When we let the flag, and therefore the country it represents, come too far into our discipled lives, we run the risk of blurring the lines between God’s kingdom and America. It was not that long ago that a man named Hitler was able to bring one of the most advanced and progressive nations in the world into a war through the use of religious fanaticism that started with a nationalist church structure. That kind of thing still happens in the world today. Is the church political? NO. God’s kingdom is not of this world, we believe in something greater than our country can represent, and we are held to a higher standard than what our country fights for. When our beliefs and faith go against what America proclaims as normative, we are reminded of the fact that God’s kingdom is not of this world. Our hope is built not on political parities but on Jesus Christ and his righteousness. Amen. First of all, then, I urge that supplications, prayer, intercessions, and thanksgivings be made for everyone, for kings and all who are in high positions, so that we may lead a quiet and peaceable life in all godliness and dignity. This is right and is acceptable in the sight of God our Savior. I spent the rest of the evening in front of the television witnessing the reports of our nation’s triumph in killing its greatest enemy, I saw crowds of people gathering in public and in front of political buildings celebrating a great victory while waving American flags back and worth. I even received a phone call from one of my childhood friends who was drunkenly celebrating in front of the White House who wished that I could be there to throw a cold one back with him. In the days that followed, people continued to celebrate across the American landscape and I felt confused. On some level I kept recalling what it felt like to grow up in Alexandria and really remember the fear I felt when the Pentagon was hit, I remember the devastation that weighed on military families in my neighborhood, I remember the world changing forever on 9/11 and being angry at whoever was responsible. But while I witnessed people celebrating the death of Osama bin Laden, I couldn’t help but wonder if we had accomplished anything. The problematic relationship between church and politics is complicated by the fact that the Christian always belongs to two communities and has loyalties to both. Our identities are divided between God and Country and both are constantly striving for our allegiance. Sadly, there will never be a time that both of them stand for and represent the same things, and we will always live in this paradoxical struggle. 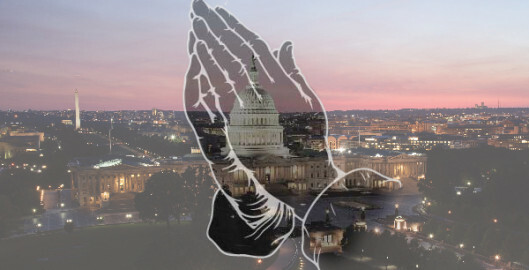 What are we to do when politicians fight for programs that go against our faith? What are we to do when our country goes to war with our enemies while Jesus is the one who calls us to love them? What are we to do with a sanctuary and worship service that displays an American flag while proclaiming the empty cross of Christ’s resurrection? What are we to do when our country no longer stands for the Christian values everyone believes it was founded upon? First of all then, I urge that supplications, prayers, intercessions, and thanksgivings be made for everyone, for kings and all who are in high positions, so that we may lead a quiet and peaceable life in all godliness and dignity. We are political in the sense that we recognize that we are in the world, but we are not of the world. That God has called us to be brave and radical people who see the world turned upside down and live into a new reality. That when we clasp our hands together to pray for everyone, our leaders and enemies, our nations and others, we spark the beginning of an uprising against disorder. The challenge of the relationship between faith and politics will always remain. Since the beginning of the church it has been a concern of Christians everywhere and it will continue to be. But if we want to truly wrestle with this problem, is we want to take steps of faith into our political culture, we begin by asking: What Would Jesus Do about government? He would pray for the government, he would listen to all people everywhere treating them with worth, and he would love them with all that he had. Let it be so with us. Amen.